A European title is rarely sniffed at these days but there's no doubt that Stade Francais would gladly trade their place in the Amlin Challenge Cup final for a spot in next weekend's Top 14 semi-finals. The 'team that Max built' was not designed to operate in the shadows but that's what they've been doing for the last few seasons. Hamstrung by financial troubles and hammered by injuries, suspensions and retirements, Michael Cheika's side struggled to an 11th place finish in the Top 14 this season, their worst since Guazzini and Bernard Laporte took the club up from Pro D2 in 1997. An Amlin win on Friday would allow the club to finish the season on a positive note and access to next year's Heineken Cup but it beggars belief that Stade Francais have found themselves in this position in the first place. While they might once have been the biggest team in France, Stade Francais are no longer even the biggest team in Paris. Those halcyon days of pink Cadillacs, pinker jerseys, scantily clad dancers and full houses at the Stade de France may have built a brand but they certainly didn't build a club. Although they are able to get 75,000 bums on seats at France's national stadium for one-off encounters, Stade's regular attendances have remained small and the resulting financial pressures recently forced Guazzini to sell off the majority of his shares in the club in a bid to keep the wolf from the door. It is against this backdrop that he will watch from the sidelines next weekend as neighbours Racing Metro take on Montpellier in a game that could well prove to be a significant landmark in the recent history of the French Championship. Montpellier, were they to win, would find themselves in their first Championship final - not bad for a club only founded in 1986. With five titles to their name, Racing have been here before, most recently in 1990, and theirs is a name synonymous with the romance of French rugby. Given that only three teams (Biarritz, Toulouse and Stade Francais) won the French Championship between 1994 and 2008, it appears that the pool of teams at the top is widening once more. Perpignan and Clermont won in the last couple of seasons and could possibly followed by another 'new' club this year. 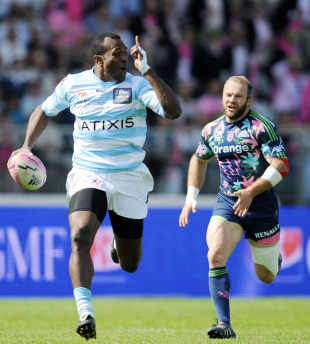 From Racing's point of view, they are back in their rightful spot at the top of French rugby. Formed as a sporting club of many different disciplines for the Parisian élite in 1882, Racing, alongside Stade Francais, dominated the early years of the French Championship before disappearing - like Stade - for the bones of a century until the emergence of the bow-tie wearing and champagne guzzling side of Franck Mesnel, Eric Blanc and Jean-Baptiste Lafond in the late '80s. Irrespective of whether they make the final in a few weeks, Racing have had another superb season, finishing second to Toulouse in the league campaign while making a decent fist of their first season of Heineken Cup action. More importantly perhaps, it would seem that they are here for the long haul. Hitherto bankrolled by the deep pockets of property magnate Jacky Lorenzetti, coach Pierre Berbizier has been able to marry a pool of young French talent with some big name imports. "The 'team that Max built' was not designed to operate in the shadows but that's what they've been doing for the last few seasons." In addition, it would seem that Lorenzetti is committed to Racing securing its long term future. The former Foncia boss has no intention of continuing to fund the club from his own pockets but is instead committed to building an ambitious 32,000 multipurpose stadium for Racing, close to La Defense. Arena 92, it is hoped, will be up and running by 2014 and will earn its corn by being one of the biggest concert venues in Paris, thus giving the club the all-important non-matchday revenues. Stade Francais of course have their own plans to redevelop Stade Jean Bouin. Work has started on the controversial, publicly funded 20,000 capacity ground, which they hope to have finished by 2013. Once in, the club hopes it will give it some much needed financial ballast but in the meantime, there will be considerable pressure on Cheika not to fall too far behind their Parisian rivals. Exiled for the next few years at the unloved Stade Charlety, Cheika will have his work cut. True, star names such as Sergio Parisse, James Haskell, Dimitri Szarzewski and Mathieu Bastareaud still adorn the team sheet but the spine of the side that collected three Championships during the 2000s have either moved on or are nearing retirement. It seems time moved on at Stade Francais but nobody noticed. Guazzini will be credited as a visionary who transformed Stade Francais into Europe's standard bearers in terms of pomp, ceremony and garish jerseys. He changed the way rugby clubs market and brand themselves, and was the first person to spot the huge untapped Parisian market. But under the veneer, the whole thing was held together with sticky tape.